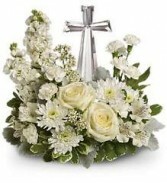 An arrangement of all white flowers consisting of stock, minicarnations, alstromeria, roses and greenery designed among a crystal cross in a designer bowl. 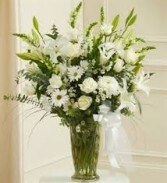 $70 and $80 includes white lilies and more roses. 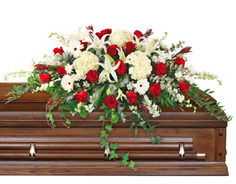 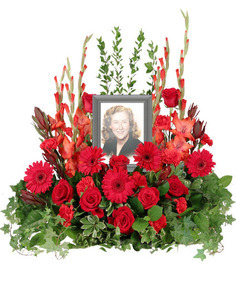 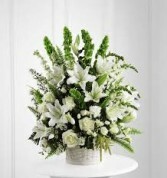 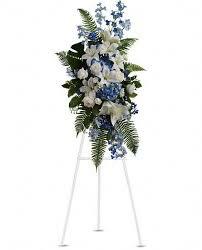 An elegant arrangement of flowers displaying sympathy during a time of loss and sorrow. This arrangement of bells of Ireland, white lilies, white snap dragons, white roses, white mini carnations, white monte casino, and mixed greens designed in a white wicker basket to represent ones sympathy during a time of loss. 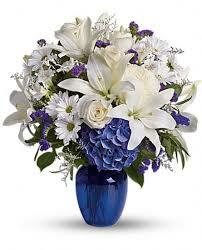 A perfect picture of peace and comfort to send in a time of loss. 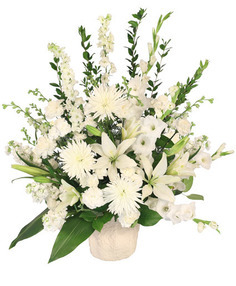 An arrangement of white lilies, white snap dragons, white roses, white monte casino, white daisies, white fuji mums, and mixed greenery in a clear glass vase designed to comfort the loss of a loved one.